Just wanted to make sure that you all had access to the most recent catalogs. I’ve updated them on the side widgets all you need to do is click and they will open for you or feel free to click on these links. 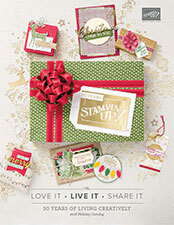 You will love all the fun new products, stamps and accessories in this catalog. Be sure to check out the new color changes and new ink pads. Contact me if you have any questions. The holidays are just around the corner so be sure to get your products now and start making all those fun holiday projects. The catalog is packed full of fun ideas and some easy project ideas. I’m happy to help if you want to create any of this or want fun ideas just let me know. So I know I’ve been MIA for a bit. I actually just realized that it’s been even longer than I thought it was. So first, I want to say I’m sorry and thanks to all of you who have stuck with me. Next, YES I’m still a Stampin’ Up! demonstrator. That being said I wanted to let you know I’m back. Things have been crazy in my life in the last few years, but I’m finally in a position that I feel I can work on my business again and I hope you will take this new journey with me. Be watching over the next little while for all the fun and exciting changes. I look forward to you all taking this journey with me.